What Is The Best Spring Lawn Care Schedule? Clean up: Set your lawn up for success by removing any tree branches that may have fallen from winter storms, any toys left out, and clearing what leaves you can that may have been left over from the fall. Grass requires plenty of sunlight, and these things may get in the way. Seed: Cool-season grasses can be planted as soon as the air temperatures get into the 60s and soil temperatures are in the 50s. Plant as soon as temperatures allow to give the seedlings a chance to get established before hot weather hits. Warm-season grasses can be planted when air temperatures are in the 70s, soil temperatures are in the 60s, and all danger of frost has passed, so you’ll want to hold off a little longer if that’s your case. Weed Control: When it’s warm enough for your grass to grow, it’s warm enough for weeds to start thriving. Use a weed control now to nip the problem in the bud. Fertilize: After the final frost, which may occur in late April or early May, fertilize your grass to give is the best chance for a green growing season. Start your watering schedule: Your growing grass needs lots of water to be healthy. Two long soakings each week is more effective than watering a little every day. Mow: Your grass actually thrives when it’s kept shorter. The rule of thumb: never cut more than 1/3 of the grass blade at a time. 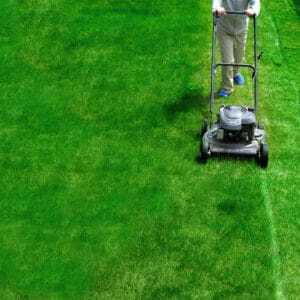 Contact Green Lawn Fertilizing for more scheduling tips. Our lawn care technicians are happy to dispense advice as well as discuss our various lawn care services with you. We’ll also provide a free quote for routine maintenance. Call us today at 888-581-5296.